Cut the bacon into thin slices and cook in a large pot. Cut potatoes, onions and carrots into small pieces (about 1x1cm) and cook them in the bacon fat for about 5 minutes, adding chilli and salt and pepper to taste. Stir frequently or they will burn. 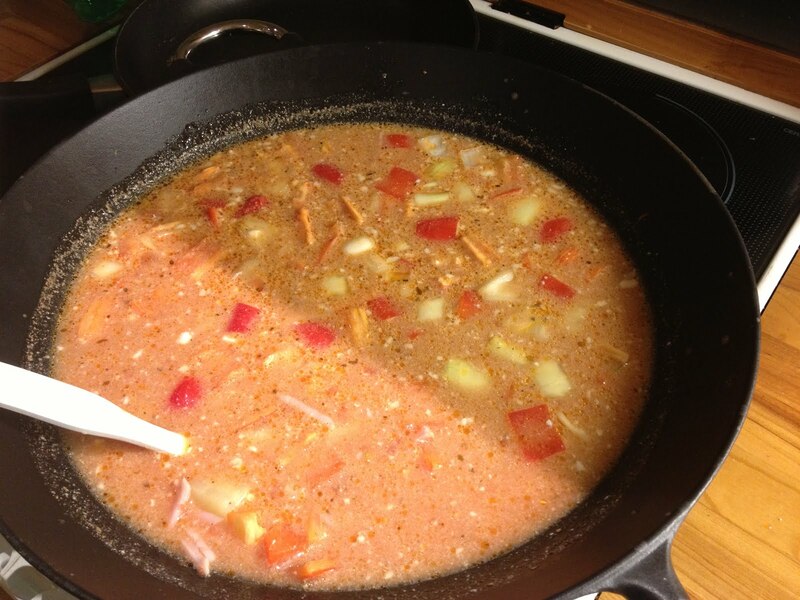 Add chicken stock and the can of tomatoes. Cut the tomatoes and squash into small pieces (about 1x1cm) and cut the bell pepper into "stripes" and add them to the soup when it starts to boil. If you're using coconut milk, add that now too. Reduce to a simmer and let it cook under lid for 30 minutes or until the potatoes are done. If you're using cream instead of coconut milk, add that now, and bring back to a quick boil. Serve with bread rolls or crush nachos on top of the soup.